Grand Rapids Comic Con - THIS WEEKEND! Greetings, all! I've got some fun stuff planned for the blog up and coming (that's right, I've been planning for once), but I wanted to give you all an announcement! This weekend, I'll be attending GRAND RAPIDS COMIC CON as a guest speaker! Having troubles sewing a costume from the ground up? Maybe you don’t feel like creating everything from scratch? Never fear! Found-Item Cosplay can help! This seminar focuses on advice and suggestions on how to make costumes out of garments and supplies you find in your house, the thrift store, and more! So you want to start making cosplay costumes – but aren’t sure where to start? Join Karmada Cosplay for a seminar focusing on the basics of how to choose a costume, pick patterns, some sewing basics and more! Ideal for the beginner cosplayer, but all are welcome! Making a costume at the last minute? Hey me too! 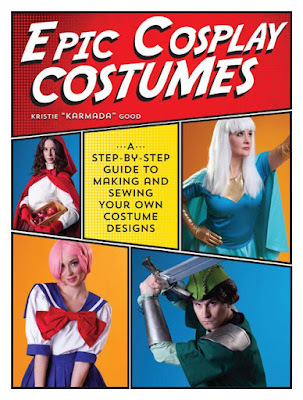 Join Karmada Cosplay to learn all sorts of techniques and basic designs that’ll get you a costume in a hurry. Topics covered will include how to create simple costume pieces from basic shapes, and some general sewing techniques to help you on all costumes. Recommended for intermediate to advanced cosplayers, but all are welcome! Want to take your cosplay to the next level? This panel focuses on more advanced construction techniques and other supplies that can make your costumes even better! Come and learn about fabric choices, some handy construction techniques, and learn a little bit about materials other than cloth. Great for intermediate to advanced cosplayers, but all are welcome! Time for some shameless self promotion, eh? Word on the street is that I'll have a table to help promote the book, and my artwork, at the show! I'll of course have copies of Epic Cosplay Costumes for sale ($25, btw), and I'm more than happy to sign them for people! I'll also have my comics, artbooks, and artist trading cards (prints and originals) for sale, and we'll see if I wanna bring anything else with me. New Fresh Name, Same Great Content! You might have noticed the past week or so I made an update to all my websites. 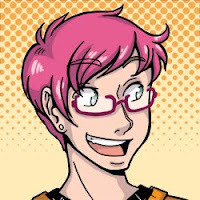 I'm officially switching names to Karmada Arts! I decided to go ahead with the change because with things like the book (and I got interviewed in our metro newspaper), people are associating me with the name Karmada now. Which is exactly perfect! I've been using the name for years, and it works as a good Pen Name/Cosplay Name/Rockstar Name for me. However, I realized that people would probably want to look me up by that name, and my art was under a TOTALLY different name. Thus, the change. Everything is now under a version of Karmada! I'm also on Snapchat, but I'm am honestly still figuring that one out because I am an Old now and this New Fangled Technology confuses me so. NO REALLY I don't get it, but I wanna understand it. I have a tutorial from a friend coming when she gets back from a trip. DON'T JUDGE ME.